It’s quite amazing how fast you can build a name for being a fair and reputable brand. All you need to do is to offer good bonuses with no small print letter, perfect customer support, zero complaints and always, always pay on time. Since their launch in 2013, that’s exactly what Lincoln casino did. Lincoln casino has a very elegant and classy design. This is one the most easy to use casino sites that I’ve seen. You won’t need to struggle to find your way – everything is exactly where it should be. The casino is powered by WGS software, formally known as Vegas Tech. You can play all the games by downloading the casino software or through instant play mode. 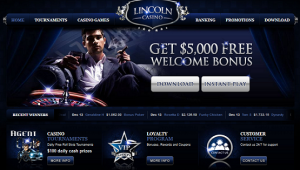 Lincoln casino welcome bonus is quite good and very straightforward. New players can redeem 100% match bonus on their first 5 deposits. Up to $1000 each. The minimum deposit amount for this bonus is $25. The bonus is a cashable. The wagering requirements for this bonus are 20 times bonus + deposit, which is good in general and especially for US friendly online casino. Please notice that you are not allowed to play roulette while wagering the bonus. Slot machine fans will have almost 150 slots to choose from. There are 40 classic 3 Reel slot machines. Our favorites would be Wheel of Chance and Cash Grab. 5 reel video slots section consists of 90 games, including the popular Amazing 7s, Funky Chicken and Golden Reels. On top of that, you have WGS unique 7 reels slots Farming Futures and Lucky 7s. Video Poker: here you can find all the popular video poker variations: Jacks or Better, Deuces Wild, Joker Poker, Bonus Poker, Aces and Faces and more. In total you have 20 Video poker games. Other games include dozen variations of Blackjack, American Roulette, European Roulette, Craps, Baccarat, Hold’em Poker, Keno, Bingo and Dice. When it comes to slot tournaments, Lincoln is one of the best casino out there. They have special tournaments set for each day of the week, paid and free. Then you have weekly events with bigger pots. On top of that you have monthly events, where the prize pool goes up to $50,000! All you need to do is click on Tournaments in the casino lobby, pick the one you wish to play and click register. The variety of deposit and withdrawal methods at Lincoln casino is not high, but it covers all the popular ones. US players can deposit with all major credit cards, including Amex and with Quick Cash. Minimum deposit amount is $10, but the minimum and maximum amounts vary according to the method. Minimum withdrawal amount is $150, while the maximum withdrawal per week is $5000. The withdrawal times are 2 days for e-wallets, 5 days for checks and 10 days for wire. There is $45 fees on checks and wires. Deposit Methods: Visa, MasterCard, American Express, Quick Cash, EcoPayz, Neteller, Skrill, Ukash, Transfer Money. You can contact Lincoln casino support 24/7 through Live Chat, email and toll free number. Average waiting time on Live chat is less than 10 seconds. One of the top USA online casinos. Very friendly, straightforward and easy to use. Very high cashable welcome bonus. Crazy slot tournaments. Timely payouts and zero complaints. The only drawback is slightly higher fees on withdrawals with checks and wires. Close to perfect!